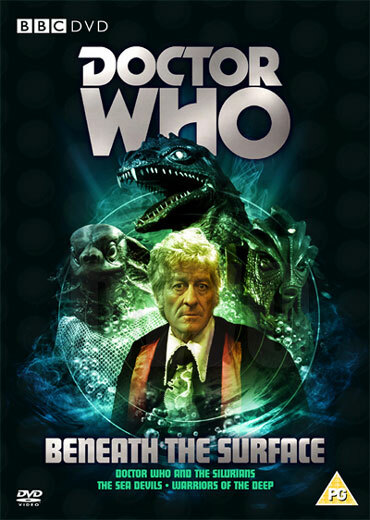 Contains the following Stories: The Silurians, The Sea Devils & Warriors of the Deep. Warriors of the Deep: Earth 2084. Two global superpowers hover on the brink of war. When the TARDIS is forced to make an unplanned visit to Sea Base Four, the Doctor, Tegan and Turlough find themselves accused of being enemy agents. Quickly embroiled in a deadly game of paranoid intrigue, it becomes clear that others on the base have sabotage and murder in mind. However there is a greater threat to Mankind: the Silurians and Sea Devils, prehistoric reptiles seeking to reclaim the Earth. Can the Doctor prevent them implementing their 'final solution' and triggering a war that could wipe out the entire human race? These stories were originally broadcast on BBC1 between 31st January - 14th March 1970, 26th February - 1st April 1972 and 5th - 13th January 1984. Commentary by Caroline John (Liz), Nicholas Courtney (The Brigadier), Peter Miles (Lawrence), Geoffrey Palmer (Masters), Timothy Combe (Director), Barry Letts (Producer) and Terrance Dicks (Script Editor). What Lies Beneath: The cast and crew explore how the socio-political climate of the late 1960s shaped this story. Also featuring new series writer Paul Cornell and former MP Roy Hattersley. Going Underground: The story's producer, director and designer discuss the problems of creating caves in a TV Studio. Now and Then: Comparing the story's locations in 1970 with how they appear today. Musical scales: A look back at an era of musical experimentation in Doctor Who. Colour Silurian Overlay: A featurette explaining how the story was restored to full colour for this DVD. Isolated Music: Carey Blyton's score is available on a separate music track. Radio Times Billings. Photo Gallery. Production Subtitles. Coming Soon Trailer. Digitally remastered picture and sound quality. Commentary by Michael Briant (Director), Barry Letts (Producer, and Terrance Dicks (Script Editor), moderated by Andrew Cartmel. Hello Sailer! The trials and tribulations of filming The Sea Devils are discussed by the cast and crew, including Katy Manning (Jo), Donald Sumpter (Ridgeway), Stuntman Stuart fell and the Royal Navy personnel who appeared as extras. 8mm Film: Amateur cine film shot during location filming with a Commentary by Michael Briant, Barry Letts and Terrance Dicks. Trails and Continuities: Recreated from off-air audio recordings made during original transmission. Isolated Music: Malcolm Clarke's score is available on a separate music track. The making of Doctor Who: The entire Piccolo Book from 1972. Radio Times Billings. Photo Gallery. Production Subtitles. Coming Soon Trailer. Digitally remastered picture and sound quality. Commentary by Peter Davison (The Doctor), Janet Fielding (Tegan), Eric Saward (Script Editor) and Mat Irvine (Visual Effects Designer). The Depths: The production team and cast recall their experiences of working on the story, featuring Penannt Roberts (Director), Johnny Byrne (Writer), Ian McCulloch (Nilson), James Coombes (Paroli), John Asquith (The Myrka), and continuity advisor Ian Levine. They Came from Beneath the Sea: A featurette exploring the realisation of the Silurians, Sea Devils and the Myrka. Science in Action: Mat Irvine discusses his effects work. Trails and Continuities: BBC1 trailers and continuity announcements from the story's original transmission. Isolated Music: Jonathan Gibbs' score is available on a seperate music track.Radio Times Billings. Photo Gallery. Production Subtitles. Coming Soon Trailer. Digitally remastered picture and sound quality.